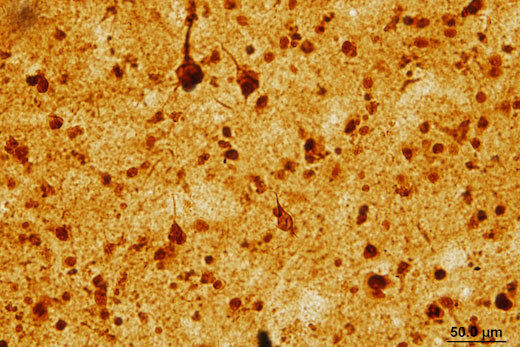 Staining of the LSD1 protein in brain samples from people with Alzheimer's disease. The pattern looks a lot like Tau, which forms characteristic neurofibrillary tangles. Removal of a regulatory gene called LSD1 in adult mice induces changes in gene activity that look unexpectedly like Alzheimer's disease, scientists have discovered. Researchers also discovered that LSD1 protein is perturbed in brain samples from humans with Alzheimer's disease and frontotemporal dementia (FTD). Based on their findings in human patients and mice, the research team is proposing LSD1 as a central player in these neurodegenerative diseases and a drug target. The results were published on Oct. 9 in Nature Communications (open access). In the brain, LSD1 (lysine specific histone demethylase 1) maintains silence among genes that are supposed to be turned off. When the researchers engineered mice that have the LSD1 gene snipped out in adulthood, the mice became cognitively impaired and paralyzed. Plenty of neurons were dying in the brains of LSD1-deleted mice, although other organs seemed fine. However, they lacked aggregated proteins in their brains, like those thought to drive Alzheimer's disease and FTD. "In these mice, we are skipping the aggregated proteins, which are usually thought of as the triggers of dementia, and going straight to the downstream effects," says David Katz, PhD, assistant professor of cell biology at Emory University School of Medicine. Katz's lab didn't set out to create mice with neurodegenerative disease. LSD1 was known to be critical in early stages of embryonic development, and he and his colleagues were interested in LSD1's role in sperm generation. Graduate students Michael Christopher (Genetics and Molecular Biology) and Dexter Myrick (Neuroscience) are co-first authors of the paper. When the researchers looked at the patterns of gene activity that were altered in the LSD1-deleted mice, they noticed signs of inflammation and other changes in cell metabolism and signaling. These changes resemble those previously seen in people with Alzheimer's disease and some types of FTD, but not in Parkinson's or ALS. A more surprising finding came when they examined brain tissue samples from Alzheimer's and FTD patients, in collaboration with Allan Levey, MD, PhD, director of Emory's Alzheimer's Disease Research Center. "We were amazed to see the accumulation of LSD1 in neurofibrillary tangles in Alzheimer's, and in TDP-43 aggregates in FTD," he says. "In both diseases, the LSD1 protein was aberrantly localized in the cytoplasm, along with these pathologies. Since LSD1 is normally localized in the nucleus, these findings provided clues to how it might be linked to the massive yet selective neurodegeneration that we observed in the LSD1-deficient mice, in the same cortical and hippocampal regions known to be vulnerable in these two distinct human neurodegenerative diseases." LSD1 erases epigenetic marks on histones, proteins that package DNA in the nucleus. In this situation, epigenetic refers to information that is not carried in the DNA itself, since the marks influence the activity of genes associated with the modified packaging. LSD1 is important during embryonic reprogramming, when genes from the egg and sperm adjust to the changed environment in the newly fertilized egg. The prevailing view is: neurons and other differentiated cells are committed to their fate – they can't change into something else. The authors believe that LSD1 is involved in enforcing this commitment, by suppressing the activity of genes that are turned on in other cell types. When LSD1 is taken away, gene activity goes a little haywire in neurons. For example, they turn on a set of genes that are usually active in embryonic stem cells. Neurons seem to be more sensitive to LSD1's deletion, in that muscle, liver, kidney and other tissues do not appear to undergo cell death in response. Katz thinks the re-activated stem cell genes is only part of the problem; instead, LSD1's absence seems to unleash a combination of several stresses, which mirror the stresses on brain cells seen in Alzheimer's disease and FTD. LSD1 has not been linked to neurodegenerative diseases before, so Katz says he has encountered skepticism from the field. "If we were just killing brain cells, we wouldn't expect the patterns of what we see in the mice to look so much like human patients," he says. "We also wouldn't necessarily expect LSD1 to be affected in the human patients." Katz's team is continuing to probe LSD1's connection to known players in Alzheimer's disease and FTD, such as the protein Tau, the major component of tangles. Potential drugs to fight neurodegenerative diseases could be found among compounds that stop LSD1 from interacting with the neurofibrillary tangles or somehow boost LSD1's function, he says. The research was supported by the National Institute of Neurological Disorders and Stroke (R01NS087142) and the National Institute of General Medical Sciences (5R25GM089615, T32GM008490).